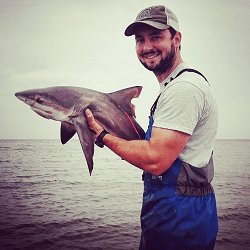 Jonathan Davis is a marine biologist, shark researcher, and Fish and Wildlife Tech for the Texas Parks and Wildlife Department based out of Sabine Lake, Texas. He has researched elasmobranchs for over 10 years all around the world from New Zealand to Australia and along the U.S. coast from Massachusetts to Texas. Currently, he is continuing research as part of his PhD along the Texas coast focusing on bull shark ecology. In addition to research, Jonathan does outreach to inform the general public about sharks and inspire interest rather than fear to promote conservation rather than destruction. This year marks the 27th Shark Week. For the past 27 years, Discovery Channel has had the unrivaled and incomparable attention of the world for one week in regards to all things ‘shark’. These 27 years have brought out the best in shark science in the beginning but have sadly declined by bringing out the worst in fear-mongering and sensationalist misinformation more recently. As a shark scientist who grew up watching Shark Week for the science the last several years have been disheartening to say the least. The science seemed to all but disappear and replaced by completely inaccurate information, scary attacks that never happened, and an epidemic of Megalodon sized proportions. Not to mention the fact that my lifelong dream of being on Shark Week was fulfilled only to have my research superimposed into a show about a ridiculous mythical shark #VoodooShark. In the midst of all these years of Shark Week, real shark science has been increasing and advancing. Sharks are an integral part of our ecosystems but many are endangered and in need of conservation. This is why shark scientists work in the background to learn as much as possible about these creatures that spark such awe and interest worldwide, not to feed fear-mongering and sensationalist desires of money hungry producers. With that being said, it would behoove all of us to utilize the unparalleled platform that is Shark Week to spread correct information and promote shark conservation. As the summer has approached, Discovery Channel producers have ensured that they are getting back to this science and steering away from the mythical, extinct, or otherwise nonsensical sharks and shows. With this glimmer of hope the goal is to continue to spread as much real shark science as possible even in areas where the information may seem foreign or unexpected. Research on sharks is relatively well known in many areas of the world such as South Africa, Australia, Cape Cod, and Florida with the help of many Shark Week episodes, relatively clear water, and awesome research. However, many less well known areas of the world also harbor immense shark knowledge. One of the less well known areas full of this knowledge is Texas. As the second largest state and the entire northwest border of the Gulf of Mexico, Texas contains 367 miles of shoreline as the crow flies and over 3,300 miles of shoreline along islands, bays, and river mouths. For years many universities such as the University of Texas, Texas A&M Corpus Christi, and Texas A&M Galveston have been carrying out shark research along this coastline. However, this research has not received as much attention as the other areas maybe because of the lack of clear water, the lower density of shark scientists, or perhaps just because of the stereotype that Texas is just full of ranches, cattle, and tumbleweeds. Regardless of the reason, the coast of Texas is prime real estate for shark research given the high productivity of its bays and rivers and the sheer density of nursery grounds. With that being said, Shark Week has taken an interest in the Harte Research Institute with this year’s Monster Mako. It should be a great step in the right direction focusing on a shark other than the great white and in an area that has not been highlighted much in the past. In addition to universities doing research, the Texas Parks and Wildlife Department has been collecting data along the Texas coastline for over 100 years. Sharks have been a part of this research given the fact that they have been inhabiting the Texas coastline for much longer than humans have. There has not been a great deal of research focused directly on sharks within TPWD but that is changing now. As a small town guy growing up in Texas, I have travelled the world researching sharks and was given the opportunity to come back home and study them here in my own back yard. I grew up in the small town of Orange in the southeast corner of Texas on the border of Texas and Louisiana. This area is surrounded by water in the form of bayous, rivers, swamps, marshes, lakes, and with a short drive, the Gulf of Mexico. I have hit the ground running with TPWD and am conducting research on bull sharks in Sabine Lake; which is the ending point of the Sabine and Neches Rivers, and could be classified as an estuary. There are many areas similar to Sabine Lake along the Texas coastline and the research is expanding. One of the major reasons for this research aside from the integral advancement of knowledge and conservation for shark species, is outreach. There is a huge lack of knowledge in the great state of Texas regarding sharks: their existence, densities, necessity, etc. As a shark advocate it is my duty to spread as much correct useful information as possible to the public. When I talk to local schools, give presentations at events, or even engage in discussion on TPWD’s social media outlets I receive an exorbitant amount of interest but also a great deal of push back and disbelief. The ideas that Texas contains estuaries that serve as shark nursery grounds, that there are over 40 different species of sharks along the coast, and that the common bull shark can travel up rivers and into non-coastal parts of Texas are very much not common knowledge. The bull shark is one of the only sharks in the world that can travel into fresh water. The Texas coast is full of bays which are connected to the Gulf but are also fed by fresh water. These estuaries provide a niche of integral habitat for bull sharks to pup and juvenile bull sharks to grow. Sabine Lake is one of these habitats and there is a seasonal population of bull sharks here. It has become evident in my coastal tracking efforts that these bull sharks do not reside in the lakes year round. As with many other estuaries where bull shark research has been carried out, there is a thermal barrier of ~20° that sparks the migration of sharks out of the Lakes. However, what is less known is the movements of these bull sharks within the large murky lakes during these warmer months. The collection data shows that the bull sharks prefer hard sandy bottoms as opposed to soft muddy ones and there has never been a TPWD collection of bull sharks without the presence of catfish of any species as well. These data are providing information for the ecology of the bull shark in coastal Texas waters and in turn aiding in their conservation. With my continued research and a growing audience for outreach I plan to spread this knowledge and recruit the next generation of shark scientists, some of which will hopefully be from Texas. The human population has increased exponentially over the years and the majority of that population has inhabited coastal areas. With an increase in population and in turn an increase in the amount of people entering the water, there will be an inevitable increase in the possibility for shark encounters. Sharks have a heightened sense of smell and taste. The summer months bring more swimmers but also more fishermen. With the presence of bait in the water the chances become higher for the presence of sharks. To be safe, avoid swimming in areas where fishing is occurring. Sharks are active throughout the day but research has suggested that they are relatively crepuscular meaning they’re more active at dawn and dusk. My research has shown more activity at night as well. With that being said, it would be wise to avoid swimming right at dawn, dusk, or at night and especially not alone. The majority of fish eaten by sharks have scales that reflect light and appear shiny in the water. Avoid wearing shiny jewelry and brightly contrasting colors when entering the water to avoid being mistaken for a shining scaly fish. These suggestions are just a few of the many ways to minimize your chances of shark encounters. The only way to be sure is to not enter the water at all. However, there are far worse and much more dangerous things to worry about than shark attacks in your daily life. There are sharks along the coasts worldwide, including Texas. This is no cause for concern but rather information to keep you informed. I wanted to take this opportunity presented by such a fantastic platform that is Southern Fried Science and the relevant timing of Shark Week to present a Texan’s take on shark research and the need for more knowledge. Follow me on twitter for more information on my research and contact me in regards to any information you may want on sharks, especially sharks in Texas.